First edition of this selection, apparent first printing. Translations copyrighted 1981 to Heyne. "Printed in Germany 1981" stated on copyright page. 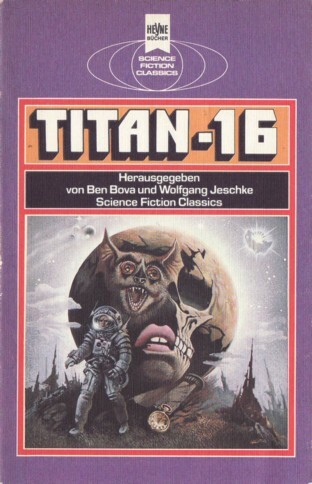 It's 'Titan-16' on the cover, but 'Titan 16' on spine and title page. Table of contents on p. 5. Cover artist credited on copyright page ("Das Umschlagbild schuf Oliviero Berni"). Cover design credited to Atelier Heinrichs & Schütz on copyright page. Month deducted from publishing schedule of Heyne in the latter half of 1981 (six to seven books per month).